Thank you for your visiting and your interest in Tune4mac products! Tune4mac 2018 Christmas Holiday Special Offer begin from Dec, 15 2018 to Jan 15, 2019. 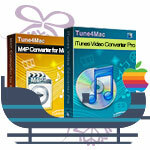 To get the latest news of Tune4mac products and promotion campaign, you can just visit Tune4mac Christmas & New Year Sales Page. It is a professional Spotify Converter to download Spotify music or playlists to common MP3, AAC, WAV or FLAC audio formats. Burn Spotify Music to a CD or share them via Email. Convert Spotify Music to MP3, etc. Perfectly compatible with newest Spotify. Fast conversion speed with high quality. free updates for Lifetime. Convert DRM-ed iTunes Audio tracks to MP3, AAC, WAV and FLAC at up to 20X faster speed with lossless quality preserved. Transfer Apple Music to Spotify, Google Drive and USB flash drive and Stream Apple Music on PS4. Support Apple Music / iTunes Audio files. Convert iTunes Music files to MP3, etc. Keep original audio quality afeter conversion. Work on macOS Mojave and Win10. The ultimate solution to remove DRM from rented and purchased iTunes M4V & M4P files on Mac OS X with lossless quality. What will the bundle do for you? The bundle will help you to enjoy any iTunes DRM-protected video and audio on any proper device with no limitation. 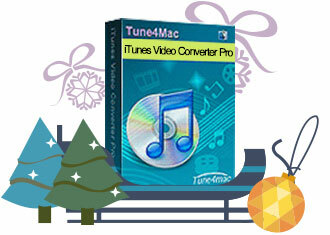 An all-in-one Mac DVD/video solution to download, record and convert normal DVD/video, and remove DRM from iTunes video. The bundle will help you to convert DVD, normal video and iTunes M4V movie & TV Shows to any popular formats. Copyright © 2018 Tune4mac. All Rights Reserved.